Now that Star Wars: The Force Awakens has finally hit theaters, with a record-breaking debut of $238 million at the box office, fans are starting to discuss several important moments and scenes. 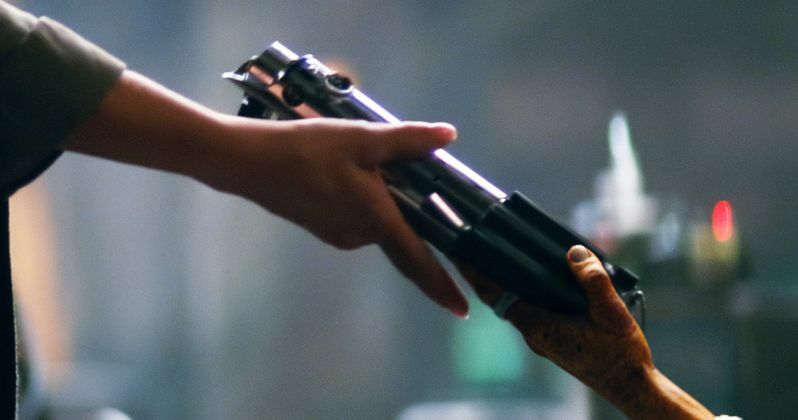 One of the most memorable moments is a scene at Maz Kanata's (Lupita Nyong'o), where she presents Luke Skywalker's (Mark Hamill) lightsaber to Rey (Daisy Ridley). When she touches this Jedi weapon, it triggers a unique vision that features moments from the past, present and future, which also includes a few familiar voices. Entertainment Weekly caught up with director J.J. Abrams, who confirmed that both Alec Guinness and Ewan McGregor's voices were heard as different versions of Obi-Wan Kenobi, while Frank Oz also returned to voice Yoda. Here's what the director had to say about the decision to use these voices. "The idea of the voices was, we wanted the audience to feel - but not necessarily be presented right in your face - this idea that familiar, Force-strong voices were connecting with her. At least as well as they could." The iconic Alec Guinness' return as Obi-Wan Kenobi may come as quite the surprise for many fans, since the beloved actor passed away in 2000 at the age of 86. He is only heard saying the word "Rey" in that scene, but J.J. Abrams revealed that one of his producers, Bryan Burk, surprised the director by managing to pull out the word "Rey" from one of Alec Guinness' previously-recorded lines. Here's what J.J. Abrams had to say about Alec Guinness' line. "I said, 'That's cool, is that the thing from Ewan McGregor?' He said 'No, we took a line from Alec Guinness saying 'Afraid.' They cut it, and you hear the performance - he's saying it the way I would have begged Alec Guinness to have said it. It is so crazy perfect. So when you hear Obi-Wan talk to Rey it is both Alec Guinness and Ewan McGregor doing the voice." Frank Oz not only provided the voice of Yoda in the first six Star Wars movies, but he also puppeteered this iconic character. While Frank Oz's puppeteering skills were not needed for Star Wars: The Force Awakens, he did contribute new dialogue for the movie, although Abrams says they ended up using pre-existing elements of the Jedi master's voice. Here's what the director had to say about Frank Oz's involvement. "He was incredibly generous and came in to Bad Robot, where we had a recording area, and he was doing Yoda, saying a number of lines we gave to him. This whole experience has been one outrageous moment after another. Just watching Frank Oz, you look at him and talk to him and his voice is very deep. I don't know why I would have thought he sounded like Miss Piggy! He was very generous to say, 'Whatever makes the movie better, I'm happy to help out.'" With the inclusion of Alec Guinness, Ewan McGregor and Frank Oz in Star Wars: The Force Awakens, it's certainly possible that their voices may be used again in director Rian Johnson's Star Wars: Episode VIII. Screenwriter Lawrence Kasdan said this vision/flashback sequence gave fans a hint of Rey's back story, but they didn't want to delve into it too deeply. Here's what the writer had to say about how Rey's story may be fleshed out even more in Star Wars: Episode VIII. "We're hoping Rian Johnson can figure that out. We were really stymied!" Both J.J. Abrams and Lawrence Kasdan know where Rey really comes from, and why she was abandoned on Jakku. J.J. Abrams reveals that this mystery, and others, will be revealed throughout the rest of this trilogy. The director adds that the biggest revelations of the original trilogy didn't happen in the first movie. "Everyone who has seen these movies thinks about 'I am your father...' and There is another...' But neither of those things were in [1977's original] Star Wars. Star Wars didn't say Luke was the son of Vader. Star Wars didn't say Leia was the sister of Luke. You didn't understand what these references were: the Empire, dark times, Clone Wars. There were these things that were discussed that don't get explained. George [Lucas] dropped you into a story and respected you to infer everything necessary to understand what you need to know. Can this movie actually also hold, 'And Rey is this ... And Finn is that ... And this is where Poe is from ...' This is the first of a series. There is a story to be told. And it will be." What do you think about these Star Wars: The Force Awakens revelations? Star Wars: Episode VIII is slated to begin production early next year, but, given how little we knew about the plot of Star Wars: The Force Awakens, it seems unlikely we'll be getting too many official details when production gets under way. Be sure to stay tuned for more on Star Wars: The Force Awakens and Star Wars: Episode VIII.